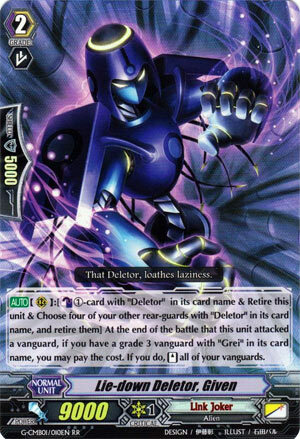 [AUTO](RC):[Counter Blast (1)-card with “Deletor” in its card name & Retire this unit & Choose four of your other rear-guards with “Deletor” in its card name, and retire them] At the end of the battle that this unit attacked a vanguard, if you have a grade 3 vanguard with “Grei” in its card name, you may pay the cost. If you do, [Stand] all of your vanguards. Eeeeeeeeh I guess compared to new Given it depends on how much stock you put in the traditional OTK and/or how flexible you want your field to be. I guess to cover all the bases new Given’s better: he procs everything important still and new Greion doesn’t cost a -1 to you so it evens out, sort of. Also new Given’s CB is generic.